With only two years of graduating seniors, we’re the new guys on the creative scene. But we don’t let that stop us from being noticed! We’ve found that our unique position allows us the opportunity to introduce ourselves in a compelling way to the agencies that inspire our work. Each year in COMM360 Visual Communication, students break into groups and consider how to say “hello.” Each group chooses an agency and sends a gift. The purpose of the package is two-fold. First, we want to thank the creatives that motivate us to work hard and let them know we’re paying attention. Second, we want to show them who we are and what we do in the hopes that we can start a conversation. Stay-tuned for more details on the agencies that are chosen this year. Until then, browse what our students came up with in fall 2012. Reid Anderson, Aaron Evans, Breanna Londgren, and Jessica Werre targeted King and Country, an ad agency/post-production house in Santa Monica, California. The team decided to send a customized replica sword. In order to package the sword, a handmade wood box was designed. They also sent a Polaroid camera with film so that the folks at King and Country could record their reactions in a retro-analog way. 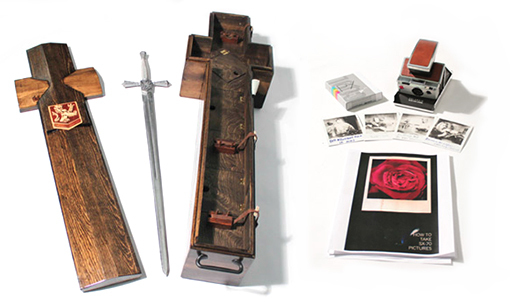 The sword box was designed with velvet-lined compartments to hold the camera, color Polaroid film, and Polaroid photos of each of the students. They recreated King and Country’s logo with wood and attached it to the lid of the box. The sword was customized using expoxy putty which was Dremeled out to create a King and Country lion on one side of the hilt and BLC lettering on the other. The URL for Bethany’s media arts site was engraved on one side of the blade and King and Country’s URL was engraved on the other, both in a Runic typeface. The team wrote a letter explaining the purpose of the gift and burned it into a long wood board which was attached to the inside of the box lid. A small mount was also made for the sword to hang from, decorated with wood burned designs. Anne Huckaby, Stephanie Erlandson, Alex Berg, and Collin Kubista targeted White House Post LA. White House Post is a post-production company with houses in London, Amsterdam, Chicago, New York, and Los Angeles. To play off of WHP’s long-standing and award-winning background in editing they put together a presentation to be played on an old-slide projector. Each slide change mimics the act of cutting footage to a different shot. The entire presentation was science-kit themed and focused on creating chemistry between Bethany’s media arts program and WHP. 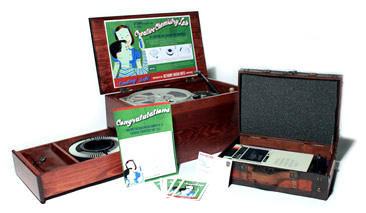 The kit included the slide projector, a tape deck to playback the presentation audio (on a cassette), test tubes filled with candy, gloves, and goggles. James Hohenstein, Zach Aker, Lea Wilmes, and Alex Sina targeted Blind, an agency in Santa Montica, California. The hand-drawn decorated shipping box included hot pads, towels, candy, custom aprons, volleyballs, and recipes in a Blind recipe box.